We offer our clients with a qualitative range of Sheet Pasting Machines. These machines are ideally used for applying glue on the corrugated sheets for making different ply. Our range comes with different rollers that are precisely finished for ensuring even lamination of boards. This machine also comes with a hard chrome rollers that improves its quality and functional life whilst ensuring the gum crushing. We make this range available to our clients at a competitive price . Neelkamal offer a wide range of highly efficient Corrugated Sheet Pasting Machine. These machines are used to apply glue on the tip of the corrugation sheets for making a different ply. 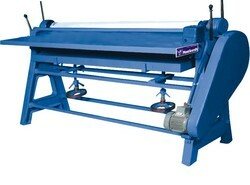 Sheet pasting machine comprises 3 rollers, which are smoothly finished for ensuring even lamination of boards. We have provided hard chrome rollers with these machines for improving the quality.Long life services of the machine and to ensure the gum crushing. The machine is simple in design and easy to operate which insure smooth finish and working. Hand fed sheet pasting machine is useful for gluing fluted side of board for making 3, 5, 7 ply corrugated board.